Ryan Moore partners the Galileo colt Giovanni Canaletto, and if he won he would be giving his sire a record equalling fourth win in the race. Unfortunately, our selection for last week’s Achilles Stakes at Haydock, Muthmir, dodged the meeting and went to Chantilly instead, where He won a 5f highly competitive Group 2 beating last years Prix De L’Abbe runner up, Catcall, emphasising yet again what a progressive sprinter He is. Definitley one to bear in mind for the Kings Stand Stakes at the Royal Meeting. However Saturday sees the 235th renewal of the world’s greatest classic, so let’s hope our selection(s) at least make it to the start this week. Aidan O’Brien is trying to win his fourth Derby in a row, and perhaps even more astonishingly equal his great namesake, Vincent O’Brien’s record of six victories. 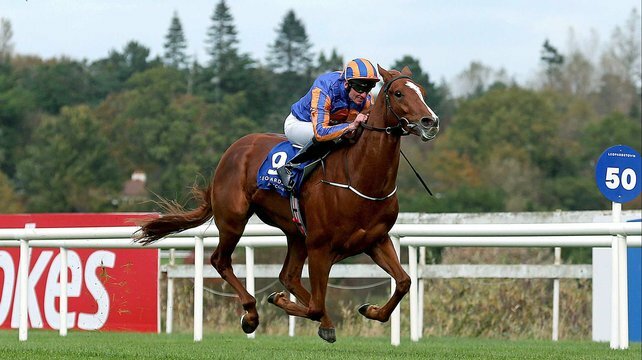 If He does it won’t be with his English and Irish 2000gns winner Gleneagles, as he has been withdrawn. However he has three left in, Hans Holbein, Giovanni Canaletto, and Kilimanjaro, and I suppose any of the three could prove to be a super sub. If the Montjeu colt Hans Holbein wins, he would be giving his sire a record breaking fifth win in the race. Interestingly He was a very late foal, and surprisingly He was still two weeks short of His third birthday when winning the Chester Vase (1m4 1/2f soft) on May 7th. (He beat the second horse home that day, Storm the Stars, rather more easily than market leader Golden Horn managed on his debut at Nottingham last October.) Bred on very similar lines to Irish Derby, and Gold Gup winner, Fame and Glory, stamina is not going to be an issue, and it is not difficult to imagine him under Seamie Heffernan making Saturday’s renewal a real staying test. Certainly if it comes up soft he would have to be on the short list. Ryan Moore partners the Galileo colt Giovanni Canaletto, and if he won he would be giving his sire a record equalling fourth win in the race. As a full brother to the 2013 winner Ruler of The World, he is certainly bred for the job, and indeed demonstrated his need for a trip in his last race, the 1m2f Gallinule stakes at the Curragh. It took him some time to get going, but was putting in his best work at the finish. With most of the O’Brien horses needing a run, this was quite a smart performance, so with Moore up and a further 2f to travel he is one to fear at the weekend. John Gosden’s son of Cape Cross, Golden Horn, has been all the rage since winning the Dante Stakes at York from his stablemate, Jack Hobbs, and Andrew Balding’s Elm Park. Clearly the best horse on the day, some, considering his pedigree, have doubts about his ability to reproduce the performance over another 1 1/2f at Epsom. His sire was an out and out miler, and despite having got the Derby winner Sea the Stars, and the Oaks winner Ouija Board, not all his offspring stay middle distances. On the distaff his dam Fleche D’or, is an unraced daughter of miler Dubai Destination, and while her first foal, Eastern Belle, is a listed race winner over 1m2f, she is by a grade 1 winner over 1m4f. The jury remains out on his stamina credentials, but to this observer he certainly wasn’t stopping at York. Having won the Group1 Racing Post Trophy, from which four Derby winners have come since 2002, Andrew Balding’s Phoenix Reach colt Elm Park, must be considered. Not bred in the purple, his sire was a multiple Group1 winner over 1m4f who does transmit stamina to many of his offspring, but until Elm Park came along had never produced a group winner. His dam Lady Brona was an 80 rated miler, and is a half sister to the fairly useful staying hurdler Tweedledrum. Hardly the pedigree of a potential Derby winner, you might say, but his racecourse performances speak for themselves. Winning his first attempt at Group2 level (Newmarket 1m gd/fm) at the end of September, he readily took the Group1 Racing Post Trophy four weeks later. He was withdrawn from the 2000gns because of the firm ground, and instead made his seasonal debut in the Dante Stakes, where he ran far too freely, took it up 3f from home, and faded in the last 150yds. We can expect a much improved performance from this very solid colt at the weekend, and it would be no surprise to see him involved at the business end. Dermot Weld’s Shamardal colt Zawraq has won his only two races, and if making it to the start, (had a set back in training) is considered. Beautifully bred on the distaff, there are few stamina doubts, but his now 13yo sire has yet to make an impression in either of the Epsom classics. However this rapidly improving colt, with his very amenable temperament, who should handle the preliminaries well, must have serious prospects of adding to the hugely impressive C.V. of the master of Rosewall House.